The House of Luxembourg (Czech: Lucemburkové) was a late medieval European royal family, whose members between 1308 and 1437 ruled as King of the Romans and Holy Roman Emperors as well as Kings of Bohemia (Čeští králové, König von Böhmen) and Hungary. 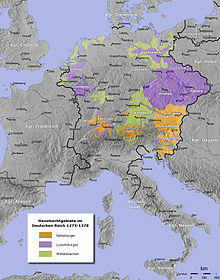 Their rule over the Holy Roman Empire was twice interrupted by the rival House of Wittelsbach. The Luxembourg line was initially a cadet branch of the ducal House of Limburg–Arlon, when in 1247 Henry, younger son of Duke Waleran III of Limburg inherited the County of Luxembourg upon the death of his mother Countess Ermesinde, a scion of the House of Namur. Her father, Count Henry IV of Luxembourg, was related on his mother's side to the Ardennes-Verdun dynasty (also called the elder House of Luxembourg), which had ruled the county since the late 10th century. Count Henry V's grandson Henry VII, Count of Luxembourg upon the death of his father Henry VI at the 1288 Battle of Worringen, was elected Rex Romanorum in 1308. The election was necessary after the Habsburg king Albert I of Germany had been murdered, and Henry, backed by his brother Archbishop-Elector Baldwin of Trier, prevailed against Charles, Count of Valois. 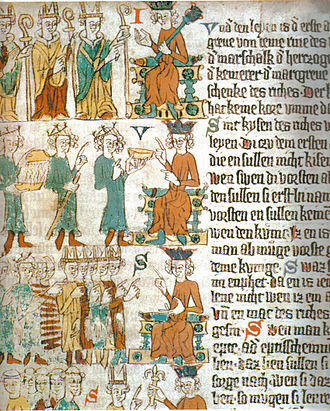 Henry arranged the marriage of his son John with the Přemyslid heiress Elisabeth of Bohemia in 1310, through whom the House of Luxembourg acquired the Kingdom of Bohemia, enabling that family to compete more effectively for power with the Habsburg and Wittelsbach dynasties. One year after being crowned Holy Roman Emperor at Rome, Henry VII, still on campaign in Italy, died in 1313. The prince-electors, perturbed by the rise of the Luxembourgs, disregarded the claims raised by Henry's heir King John, and the rule over the Empire was assumed by the Wittelsbach duke Louis of Bavaria. John instead concentrated on securing his rule in Bohemia and gradually vassalized the Piast dukes of adjacent Silesia from 1327 until 1335. His son Charles IV, in 1346 mounted the Imperial throne. His Golden Bull of 1356 served as a constitution of the Empire for centuries. Charles not only acquired the duchies of Brabant and Limburg in the west, but also the former March of Lusatia and even the Margraviate of Brandenburg in 1373 under the Kingdom of Bohemia. The family's decline began under Charles' son King Wenceslaus, deposed by the prince-electors in 1400 who chose the Wittelsbach Elector Palatine Rupert. In 1410 rule was assumed by Wenceslaus' brother Sigismund, who once again stabilized the rule of the Luxembourgs and even contributed to end the Western Schism in 1417; however, with his death in 1437, the senior branch of the dynasty became extinct. He was succeeded by his son-in-law, the Habsburg archduke Albert V of Austria. The Habsburgs finally prevailed as Luxembourg heirs, ruling the Empire until the extinction of their senior branch upon the death of Maria Theresa in 1780. Henry VII (1275–1313) — elected King of the Romans in 1308 succeeding assassinated Albert of Habsburg, crowned Holy Roman Emperor in 1312. He was succeeded by Louis IV from the House of Wittelsbach. Baldwin — brother of Henry, Prince-Archbishop of Trier and thereby Archchancellor of Burgundy 1307–54. John the Blind (1296–1346) — only son of Henry. He was enfeoffed with Bohemia by his father in 1310, married the Přemyslid heiress Elisabeth of Bohemia and deposed the Bohemian king Henry the Carinthian. Charles IV (1316–78) — eldest son of John. He was elected King of the Romans in opposition to Louis IV in 1346 and succeeded his father as king of Bohemia in the same year, crowned Holy Roman Emperor in 1355. John Henry, Margrave of Moravia — younger brother of Charles. He married Margaret, Countess of Tyrol, daughter of Henry the Carinthian in 1330. Jobst of Moravia (1351–1411) — eldest son of John Henry. Margrave of Brandenburg 1388–1411, elected King of the Romans in 1410. Wenceslaus (1361–1419) — eldest surviving son of Charles. As Margrave of Brandenburg from 1373 to 1378, he was elected King of the Romans in 1376 and succeeded his father as King of Bohemia in 1378. Declared deposed by the prince-electors in 1400, he was succeeded by Rupert of Wittelsbach. Sigismund (1368–1437) — younger son of Charles. Margrave of Brandenburg from 1378 to 1388, he was King of Hungary from 1387 in right of his wife Mary of Anjou, and was elected King of the Romans in 1411, succeeding his brother as King of Bohemia in 1419, being crowned Holy Roman Emperor in 1433 yet he left no heirs male. Jacquetta of Luxembourg (1415/1416-1472) — Mother of Queen Consort, Elizabeth Woodville and subsequent ancestress of all English and British monarchs since Henry VIII including the current monarch, Elizabeth II. 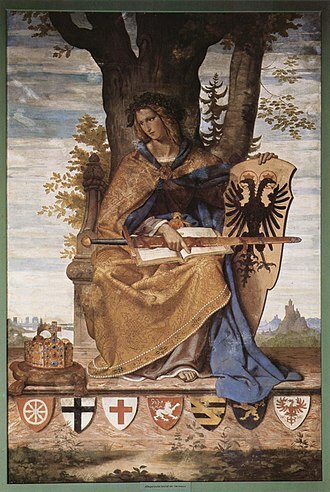 Elizabeth of Luxembourg, only child of Emperor Sigismund, married Archduke Albert V of Austria from the Albertinian line of the House of Habsburg in 1422, becoming queen consort of Hungary from 1437 as well as Queen of the Romans and queen consort of Bohemia from 1438 until Albert's death in 1439: she was the heiress who conveyed the major portion of the Luxembourg inheritance to the Habsburgs and, later, the Jagiellons through her daughter Elisabeth of Austria. According to the Salic law, the succession could have been disputed, in which case it would have passed collaterally to the cadet branch of Ligny. That branch descended from a younger son of Henry V, and was headed by Louis de Luxembourg, Count of Saint-Pol, before he was executed for treason by Louis XI of France. 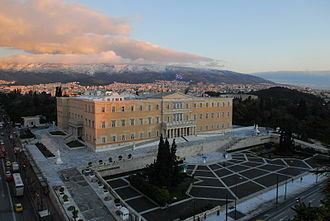 Wikimedia Commons has media related to House of Luxembourg. ^ "Sigismund (Holy Roman emperor) - Encyclopædia Britannica". Britannica.com. Retrieved 2014-03-29. 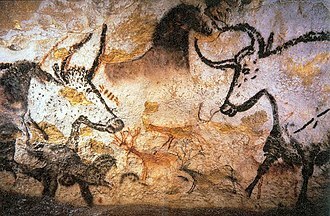 ^ Cave, Roy; Coulson, Herbert (1965). A Source Book for Medieval Economic History. New York: Biblo and Tannen. p. 336. The Silesian Piasts were the elder of four lines of the Polish Piast dynasty beginning with Władysław II the Exile, eldest son of Duke Bolesław III of Poland. By Bolesławs testament, Władysław was granted Silesia as his hereditary province, the history of the Silesian Piasts began with the feudal fragmentation of Poland in 1138 following the death of the Polish duke Bolesław III Wrymouth. Władysław soon entered into conflicts with his brothers and the Polish nobility. When in 1146 he attempted to control of the whole of Poland, he was excomunicated by Archbishop Jakub ze Żnina of Gniezno. He was received by King Conrad III of Germany, his brother-in-law by Władysławs consort Agnes of Babenberg and the Seniorate Province came under the control of second-born Bolesław IV the Curly, Duke of Masovia. In the same year King Conrad III attempted to power for Władysław. 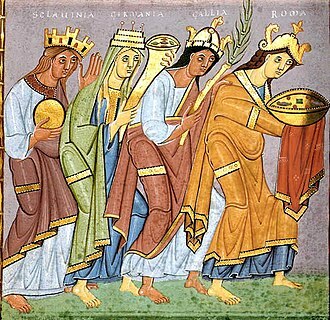 He died in 1159 without returning to Poland, the Duchy of Silesia remained within the Polish seniorate constitution, but Władysławs sons were obliged to pay a yearly tribute to the Holy Roman Emperor. Mieszko Tanglefoot the smaller Duchy of Racibórz around Racibórz and Cieszyn and their minor brother Konrad Spindleshanks received Żagań, Głogów and Krosno from the hands of Bolesław the Tall. In the same year, Poland abolished the seniorate and the Silesian duchies became independent entities, Henry I the Bearded actively took part in the inner-Polish conflicts and expanded his dominion with determination. Henry, before securing in 1229 the sovereignty in Kraków, had no less persevering efforts to bring Greater Poland under his dominion. From the beginning of the century he had not ceased to intervene in the disputes which were carried on between the descendants of Mieszko the Old. At last in 1234, a half of that province was formally ceded to him. As a guardian of minor dukes, Henry moreover ruled over Opole and this Silesian prince not only intended to enlarge his possessions, he proposed to make them the nucleus of a restored Kingdom of Poland. He became duke of Kraków in 1232, which gave him the title of the Senior Duke of Poland, Henry expanded his realm outside Poland ruling over Barnim, Teltow as well as parts of Lower Lusatia. John Henry of Luxembourg was Count of Tyrol from 1335 to 1341 and Margrave of Moravia from 1349 until his death. Henry was born at Mělník, the surviving son of King John of Bohemia from the House of Luxembourg. John Henry therefore was the brother of Emperor Charles IV. His father John had made attempts to reconcile with his former rival Henry of Gorizia-Tyrol, Duke of Carinthia and Count of Tyrol, in 1327, his son, John Henry, and Henrys daughter, Margaret Maultasch, were betrothed. Henry had no heirs and John the Blind expected a considerable enlargement of the Luxembourg lands. John Henry and Margaret married on September 16,1330 at Innsbruck, King John the Blind felt deprived, he put an end to his quarrels with Casimir III of Poland and campaigned the Austrian duchy. A peace was concluded at the city of Enns on October 9,1336, Charles IV acted as regent for his 14-year-old brother John Henry and soon came into conflict with the Tyrolian nobility. Furthermore, John Henry and his ugly wife had developed a strong aversion to each other. Conversano is an ancient town and comune in the southern Italian province of Bari, Apulia. It is 30 kilometres southeast of Bari and 7 kilometres from the Adriatic coast, one horse born in 1767, became one of the principal stallions for establishing the Lipizzan horses. The town of Conversano was settled as early as the Iron Age, later, as evidenced by the 6th-century BC necropolis, it became a flourishing trade town that was influenced by the nearby Greek colonies. Norba was conquered by the Romans in 268 BC and seems to have been abandoned around the time of the Visigothic invasion of Italy in 410–411, the toponym, Casale Cupersanem, is known from the 5th century AD and was a bishopric seat from the 7th century. After the counts death in 1101, the county was inherited by his sons Robert, in 1132, defeated by Roger II of Sicily, Alexander fled to Dalmatia, and the county was assigned to Robert I of Basseville, who was succeeded by his son Robert II. In 1690 the town was struck by plague and decimated, in 1921, a local socialist deputy, Giuseppe Di Vagno, was assassinated in Mola di Bari by Fascist militia. This list may not be complete, conversanos main attraction is the medieval Castle, which dates from the period of Norman-Hohenstaufen rule in the Kingdom of Sicily. The castle is located on a hill overlooking the city, and probably dates from the Gothic Wars and it has a single round tower that was added by Giulio Antonio Acquaviva. The Romanesque cathedral is the see of the diocese of Conversano-Monopoli and it was built in the 11th century but received new decor in the 14th and, in Baroque style, in the 17th centuries. The exterior is in Romanesque style with a large 15th-century rose window, the floor plan is T-shaped with two eastbound apses, the aisles are characterized by matronaei and, in the left one, a 15th-century fresco from the Pisan school. The church houses the icon of the Madonna della Fonte, protector of the city, the Benedictine Monastery, according to tradition, in the 6th century, was once one of the most powerful in Apulia. In 1266, the Benedictines were replaced by a group of Cistercian nuns from Greece and it was the only convent in western Europe that allowed nuns to wear male religious symbols, such as the mitre. 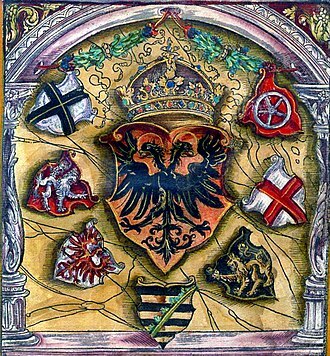 Monarchy of the Silesian Henries. Baldwin in the Balduinbrunnen, Trier. Basic administrative parts until the French revolution, including detached Sprimont.